Note of December 18, 2018: Be sure to check the comments section for information on some of the people mentioned in this post. 1877-1879 autograph album of Fred H. Means Witham of Surry, Maine, while he was attending Eastern State Normal School at Castine, Maine. The album measures approximately 7-1/4" by 4-1/4" and contains the sentiments of 113 of Fred's relatives, friends, fellow schoolmates at Eastern State Normal School and possibly some of the administrative staff. An alphabetical surname list of the inscribers, together with any personal information they offered, appears at the end of this post. Some of the students mentioned are named in an 1880 Eastern State Normal School catalog, which is the subject of another post. The campus of Eastern State Normal School, which operated from 1867 to 1942, is now the campus of Maine Maritime Academy. 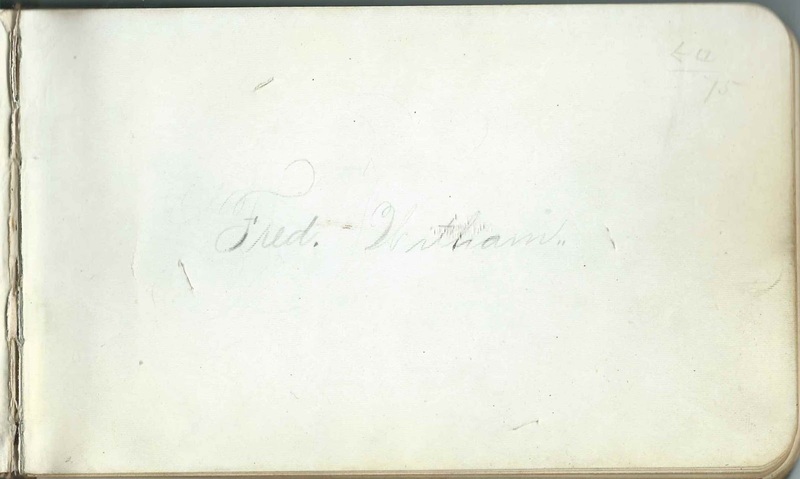 Fred H. Means Witham was born January 27, 1859 at Surry, Maine, son of Frederick W. Witham and Cathalena (Means) Witham, "Kate". At some point after his time at Eastern State Normal School, Fred moved to Portland, Maine, to teach. On July 3, 1915 at Portland, Maine, he married Charlsie T. Sartor of Texas, also a teacher. Fred died shortly after, on January 20, 1917 at Portland, Maine, and is buried at Surry, Maine. His death record indicates that he had suffered from cancer for 18 months; perhaps he knew about his diagnosis at the time of his marriage or perhaps it came as a shock not long into the marriage - tragic either way. 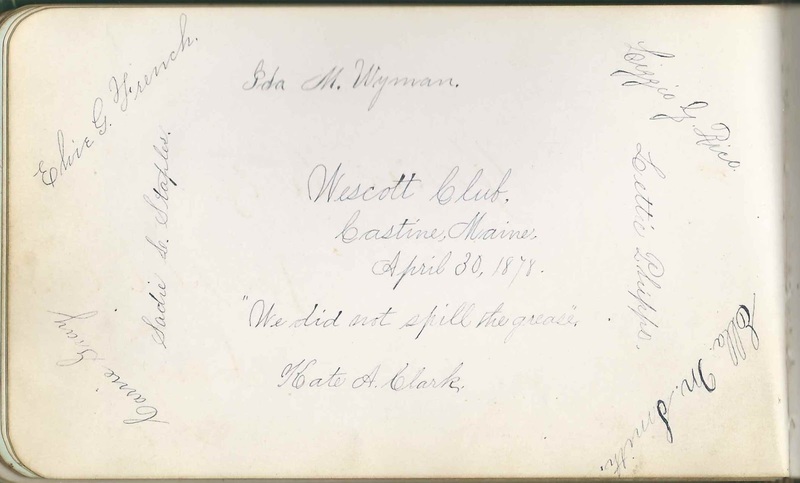 One page in the autograph album contains the autographs of eight members of the Wescott Club, presumably at Eastern State Normal School, inscribed on April 30, 1878. 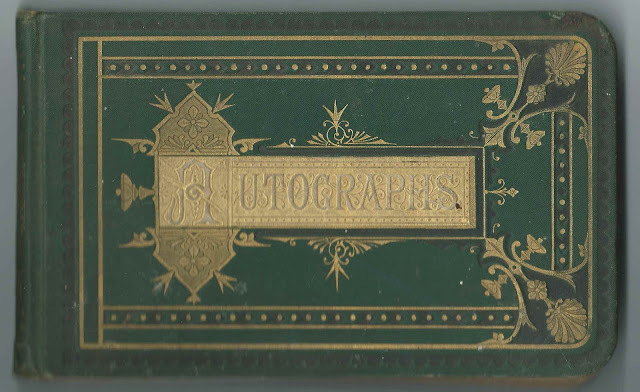 The inscribers were Elvie G. French; Ida M. Wyman; Lizzie G. Rice; Sadie L. Staples; Carrie Gray; Lettie T. Phipps of East Orrington, Maine (who also inscribed an individual page); Ella M. Smith and Kate A. Clark of Tremont, Maine (who also inscribed an individual page). Sadly, the page inscribed so hopefully on September 7, 1878 at Eastern State Normal School at Castine, Maine, by Charles E. Allen of Garland, Maine, has a newspaper death notice tucked in. Charles died November 9, 1880 and is buried in the Evergreen Cemetery at Garland, Maine. Inscribers in the Album - if you have information to share on any of the people mentioned below, please leave a comment or contact me directly. 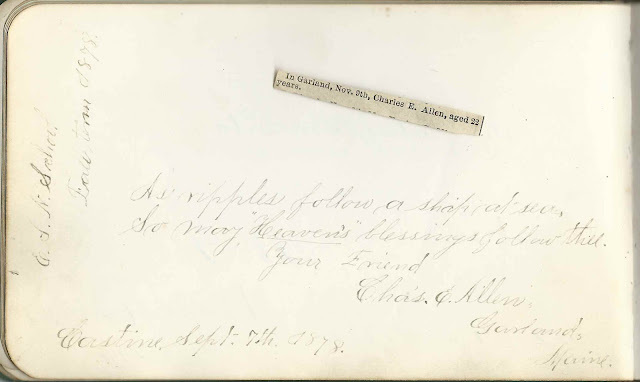 Charles E. Allen of Garland, Maine; inscribed at Eastern State Normal School at Castine, Maine, on September 7th, 1878. Sadly, there's a newspaper death notice indicated that Charles died on November 9th, no year listed, at the age of 22. His Find a Grave memorial shows a death date of November 9, 1880. Fred W. Foster. "There's always room in the upper story." Charles J. Mathews of Lincolnville, Maine; inscribed at Castine, Maine, on October 30, 1877. He was album owner Fred Witham's roommate at Eastern State Normal School at Castine. 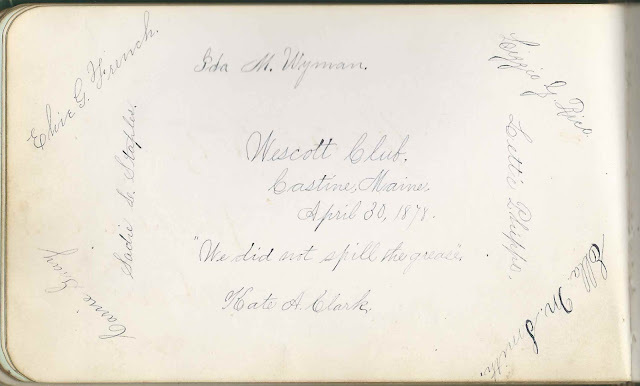 Lillian G. Osgood of Surry, Maine; inscribed on February 12, 1878. Presumably Lillian G. Osgood. George A. Sampson of Caribou, Maine. Anna Marie Lee Jarvis, born 1856, and Irving Austin Jarvis, 1859, were 2 of 11 children of Henry Augustus Jarvis, 1822-1897, and Nancy A Joy, 1820, of Surry, Maine. Irving died in 1932 in LA, was married to Frances Harron and had 5 children. Elmer E Milliken, 1860-1921, son of Horatio Milliken and Julia Blaisdell. Lizzie E Milliken, 1857, daughter of Henry Milliken and Estelle Holt. All 4 were my 2nd cousins 3 times removed. Thank you for this information! I've amended the post to include a note directing readers to your comments. Manoel Almond Gaspar, 1861-1924, my 3rd cousin 2x removed. Lillian G. Osgood, 1861, daugher of Newell Osgood and Adaline Grinell. My 2nd cousin 3x removed.